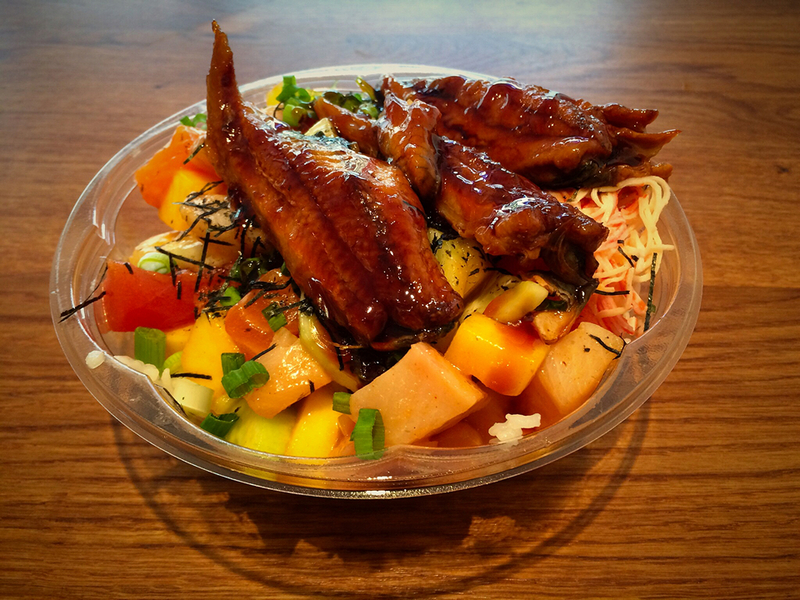 A great big aloha 🤙 to the new kid on the block, Poké Bowl Station at 237 Flatbush Ave, Prospect Heights, Brooklyn near Barclays Center. Sure, we have plenty of great sushi 🍣 restaurants in Park Slope and Prospect Heights, but poké is its own thing: think of it as Hawaii’s cross between chirashi sushi and ceviche. In addition to almost a dozen signature dishes, they offer infinitely customizable options: choose your base (three kinds of rice or salad or zucchini noodle), proteins (a dozen choices ranging from tuna, salmon, and yellowtail to baby octopus, shrimp and even chicken), plus mix-ins, sauces, toppings and crunch and you’re sure to be thrilled with the results. In addition to the variety, I was impressed with the freshness and quality of the ingredients – everything I tasted was truly delicious. 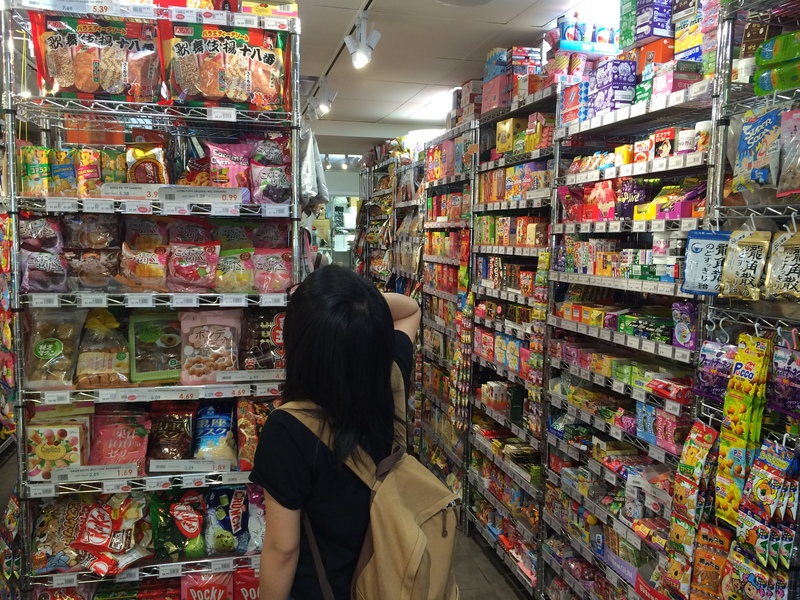 They also offer a wide variety of drinks including bubble tea, fruit tea, and yakult (yogurt drink). Tip: they offer all their sauces opposite the main counter in squeeze bottles, so if you’re not sure how you want to roll when you order, you could skip the sauce on your bowl and go rogue instead – try a couple that look interesting and add them yourself. It’s not quite the same of course (the sauce should go directly on the fish), but it’s great if you’re in the mood to experiment. Shown here is The Triforce with tuna, salmon and yellowtail plus lots of other goodies. Since I love eel, I asked if they would customize their signature bowl and they happily complied. 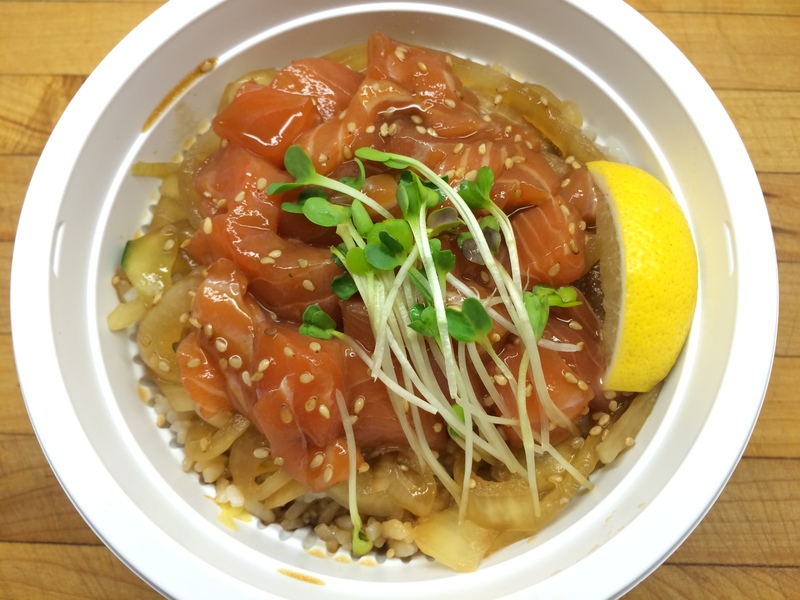 Mahalo 🙏 for bringing your ’ono grinds to the neighborhood, Poké Bowl Station – I’ll be back soon! 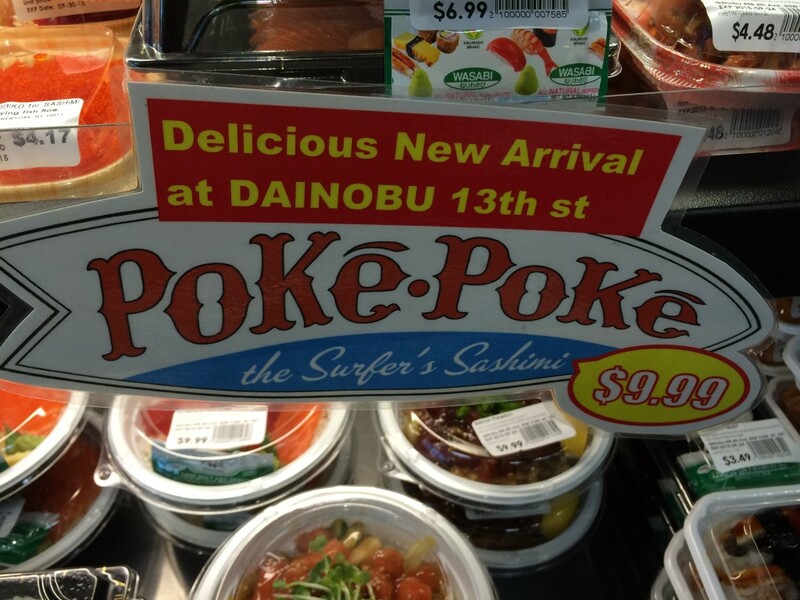 Poké means cut or slice in Hawaiian. In this case, it refers to morsels of raw fish that have been marinated in soy sauce and sesame oil, often accompanied by sweet onions, chopped scallion, seaweed, chili pepper (or a similarly spicy component like sriracha chili sauce), ginger, and occasionally roasted crushed candlenuts or macadamia nuts. 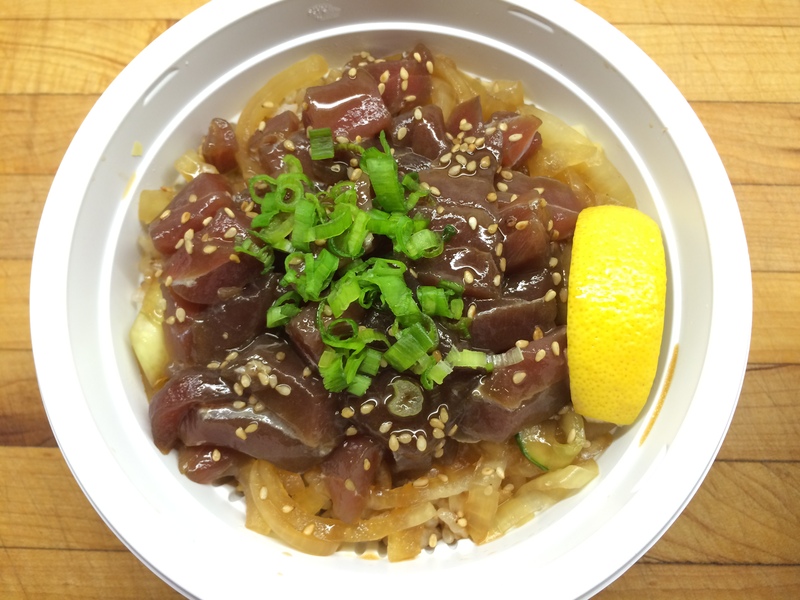 Think of it as sashimi dressed up as a fashion plate or perhaps Hawaii’s answer to ceviche. In Japanese, donburi (丼), often truncated to simply don, means “bowl” and refers to a bowl of rice served with numerous options of simmered toppings: pokedon is a bowl of poké over rice. Although not impossible to find in our fair city (as a matter of fact, I suspect it’s poised to be the Next Big Thing around these parts), I was surprised to see a grab ‘n’ go rendition at Dainobu, the Japanese deli and grocery chain. Considering the fact that I’ve been spoiled by stores like Mitsuwa in Edgewater, New Jersey and Sunrise Mart on Stuyvesant Street in the East Village, I was happy to discover a dizzying array of all things Japanese including an udon bar in the back. Even better, you’ll find both salmon and tuna pokedon there. I gussied mine up with some pickled ginger and furikake (a mixture of seaweed, sesame seeds, dried bonito and the like, available in a panoply of variations). But the squeeze of lemon that was included in the bowl was just what it needed to get its game on.